As a uni student I always need a good tote bag to carry around my books and things. At last count I had six, most of which have been used to the point of fading beyond recognition, and three in rotation at the moment. The first one pictured is absolutely nonsensical and absolutely my favourite; the red, white and blue stripes down the side just perfect it. I found it at a little Asian shop in the mall where I haggled with the shop lady until we agreed on $20. Usually I would never barter but she started it so! the elephant one is so cute!! Those are much prettier than mine! 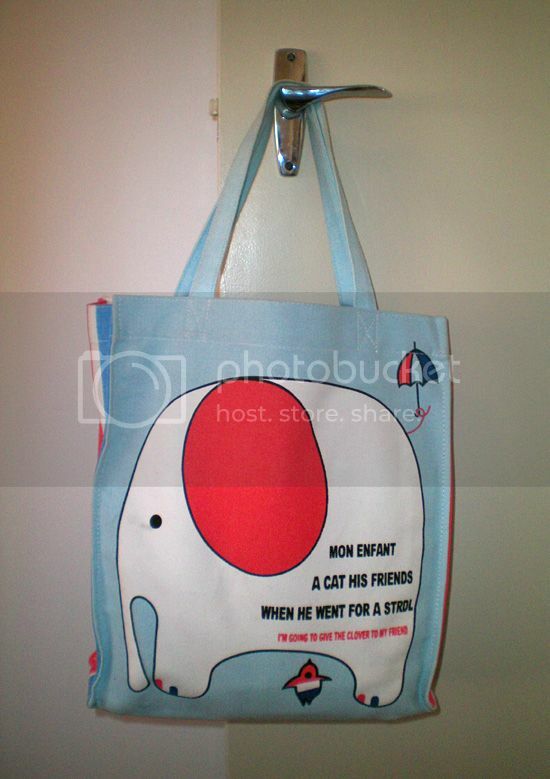 ohh i love the elephant tote! you're in melbourne aren't you? i LOVE the elephant tote! I have an 'engrish' one myself with a picture of a cat with a dream bubble, but instead of a bubble it's a fishie. "Dreaming about fish every day, I see the fantasy as if the cloud was fish." 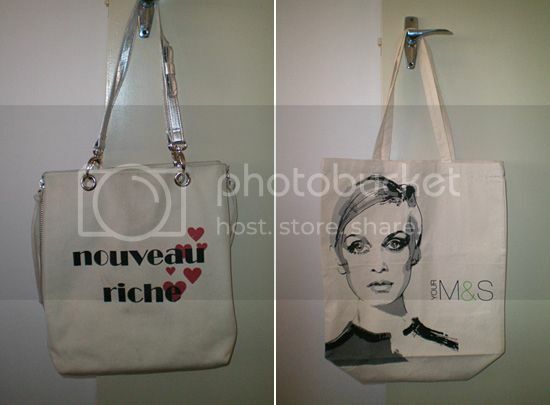 does sportsgirl still sell the nouveau riche tote bag? i've just realized that i'm in love with it! lol late reaction..anyway, i can't believe i did not purchase one..i always drop by sportsgirl whenever i hit the mall!